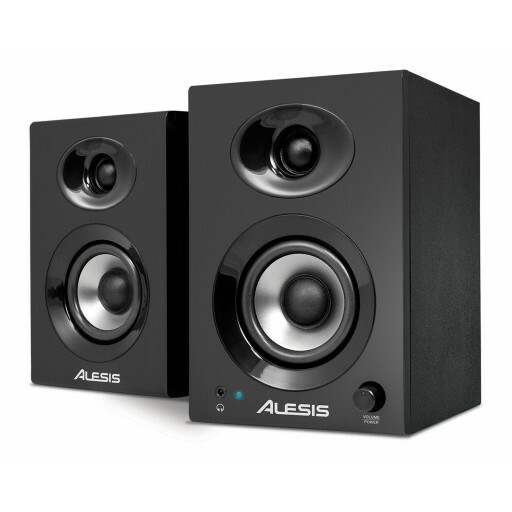 While it’s true that the Alesis Elevate 3 monitors are not designed to be a main set of speakers in major recording and prost production facilities, they are however an excellent and affordable decision for your home computer desktop or small project-based studio. Alesis Elevate 3 monitors come as a stereo-matched pair to provide a clear, full sound for your multimedia content and more. Built using technology adopted from Alesis’ award-winning Monitor One and M1 Active professional studio monitors, Elevate 3 Studio Monitors are the perfect way to upgrade your computer or mobile device experience. Each speaker is housed in a handmade, custom wood cabinet that helps provide natural bass and feature an elliptical waveguide with Directional Articulation technology. You'll also have the ability to increase power and bass extension by connecting an optional powered subwoofer. Elevate 3 Studio Monitors contain powerful, three-inch woofers, crisp, one-inch silk-dome tweeters and dedicated bi-amplified power. Alesis engineers carefully selected and tuned these crucial components to work in concert as a single unit within the custom wood cabinet to deliver full lows, clean highs and a detailed compelling stereo image. Magnetic shielding ensures that you’ll never have to worry about placement or interference with displays, TVs and other electronic equipment. And unlike passive speakers, Elevate 3 monitors have a volume knob built right in to the front panel for easy control. Alesis has been creating studio monitors for nearly a quarter century. In that time, they have learned a lot about maximizing sound and sonic clarity. Elevate 3 Studio Monitors leverage Alesis’ experience in designing studio loudspeakers by employing custom-designed wood cabinets that stay natural and neutral, regardless of the frequency content or volume. More importantly, each Elevate 3 cabinet features an elliptical-shaped waveguide set around their high-frequency driver Ã¢â‚¬” a feature commonly found on premium speakers far more expensive. Surrounding the high-frequency driver, the waveguide optimizes the throw of sound. Its elliptical shape is wide horizontally, creating a wide listening “sweet spot," so you can move left or right without losing stereo image. And because its shape is narrow vertically, the waveguide reduces reflections off of your computer table, below, and the ceiling, above. This translates to clean, consistent and focused sound every time you turn on your pair of Elevate 3 Studio Monitors. The elliptical waveguide and carefully formed radiuses on each Elevate 3 monitor come together to form what we call Directional Articulation technology. That's a fancy way of saying you get incredible sounding speakers that won't require a second mortgage on your house. An RCA stereo pair input is onboard, perfect for connecting mixers, interfaces, and virtually any other piece of audio gear. A 1/8-inch stereo connection gives you the ability to switch to headphones easily at anytime, and connecting the speakers is just as easy, requiring just one standard 1/8” cable (included). If you're frequently on the move, Elevate 3 is the speaker for you: they feature a built-in power supply so they'll work worldwide with no wall-wart power supply to lose! Elevate 3 Studio Monitors are designed to produce natural frequency response. But if you need a little more low-end punch, a convenient bass-boost switch does the trick. And if you need even more power and low-end extension, Elevate 3 features a subwoofer output compatible with virtually any powered subwoofer.